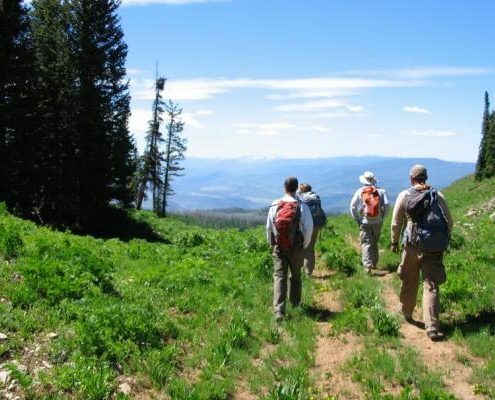 There are many hiking trails in and around the Glenwood Springs area. While some are more popular than others, like Hanging Lake Trail, the one thing they all have in common is beautiful scenery. 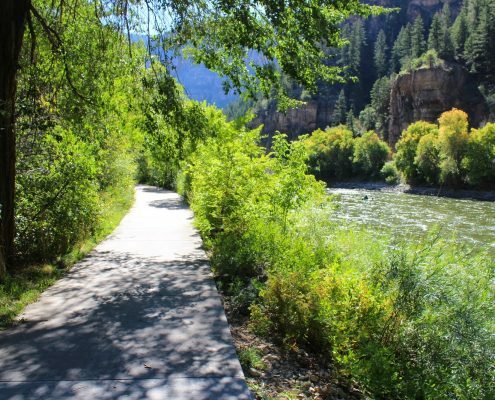 Whether a steep mountain trek (Mitchell Creek Trail) or a leisurely stroll along a river on a paved pathway (Rio Grande Trail), Glenwood Springs has many options for all skill and endurance levels. 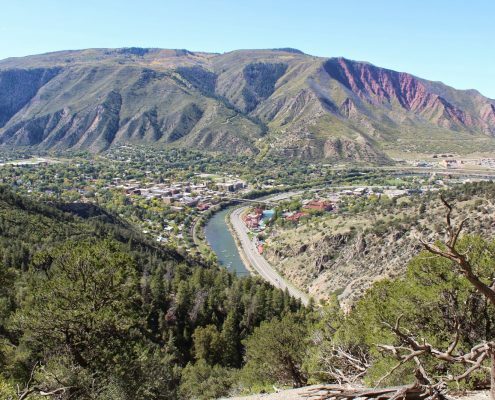 Below are 10 popular trails around the area that are easily accessible, and for a full list of Glenwood Springs trails, visit the Glenwood Chamber trail guide. 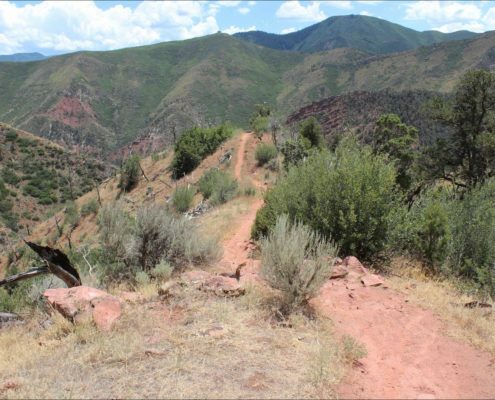 Description ~ For a quick route to expansive views of Glenwood Springs and the Flat Tops, the Scout Trail is a natural. The trail climbs up a gully and then contours east, swinging out onto dry hillsides and then ducking back into an oasis-like gulch. After heading to another outlook, it makes a beeline for the summit of Lookout Mountain. 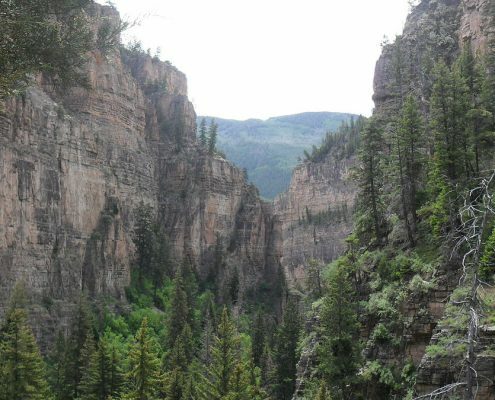 Below the summit, the Scout Trail intersects with the Bear Creek Trail, which takes hikers along the south rim of Glenwood Canyon. Take a map to avoid confusion about your route. Description ~ Climbs out of Glenwood Canyon from the Hanging Lake Trail. Connects with Forest Service Road 622 north to Coffee Pot Springs. Trail steep and rocky in places. Description ~ This short trail winds up a hillside to the historic pioneer cemetery established in 1886. From the cemetery, hikers get a tall view of the town and can wander around looking at the old headstones. 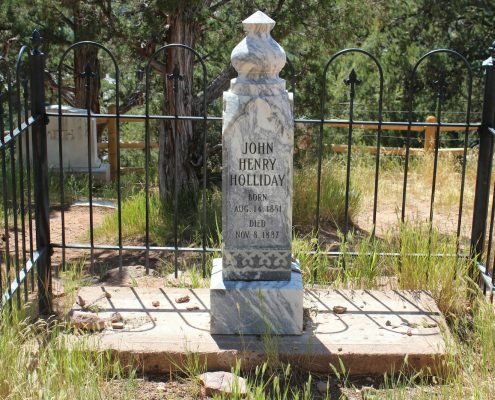 Somewhere in this cemetery is the grave of John Henry "Doc" Holliday, the former gunslinger who came to Glenwood Springs hoping to be cured of tuberculosis, and the grave of Henry Logan, better known as the train robber "Kid Curry." This is a great trail for families with small children or older folks. Description ~ Travel on this popular concrete path from the Vapor Caves (east of the Hot Springs Pool) along I-70 and the Colorado River to the east trailhead west of Dotsero. Rest areas at No Name, Grizzly Creek, Hanging Lake, and Bair Ranch. 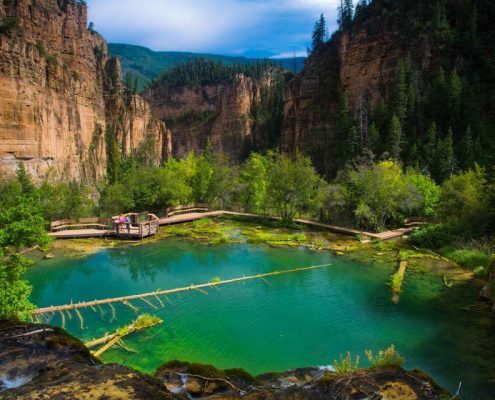 Description ~ This popular trail climbs up along Dead Horse Creek, crossing seven footbridges on its steep route to the beautiful travertine lake. A few level stretches and shaded benches give hikers a place to rest. The final push to the lake is a set of steep stairs hewn into the rock. A boardwalk extends around the lake, giving a view into the turqoise-blue waters of native cutthroat trout. Waterfalls cascade into the lake through mossy overhangs. For an extra thrill, follow the Spouting Rock Trail above the lake to see water gushing straight out of a hole in the limestone cliff and enjoy the cooling spray. NOTE: Because of its fragile ecosystem, visitors are not allowed to enter the water or climb on the logs in the lake. Please stay on the trail and obey posted signs in this unique and fragile environment. 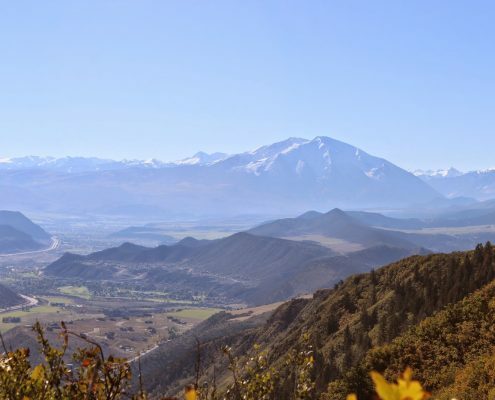 Description ~ The route traverses up Red Mountain to an overlook, with beautiful views of the Roaring Fork Valley and Mt. Sopris. Description ~ Named after Jess Weaver, a distinguished rancher who lived in the area and died in No Name Creek. Description ~ Mitchell Creek Trail is the only hiking trail that connects the Flat Tops plateau directly to the town of Glenwood Springs. 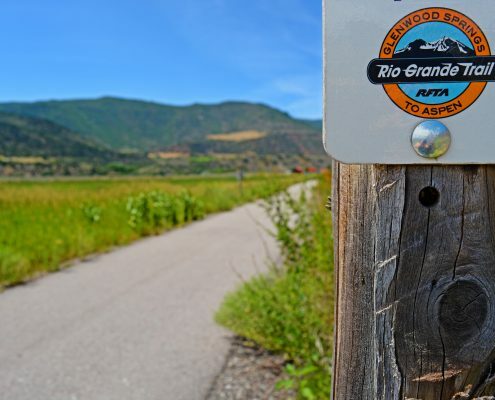 Description ~ The Rio Grande Trail is an easy trail you can walk, hike, run, bike, and horseback ride that is dog friendly. The trail follows the corridor of the historic Denver and Rio Grande Western Railroad, whose first train reached Aspen in October 1887. 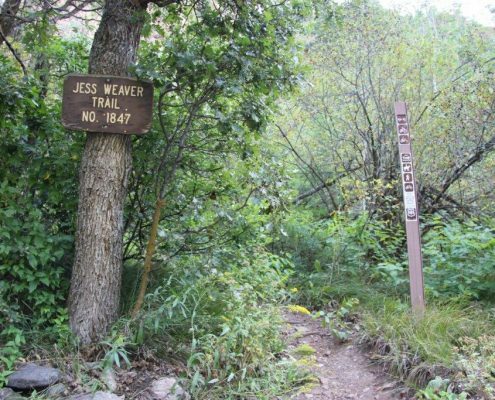 The mostly paved trail spans the entire Roaring Fork Valley and connects Aspen, Basalt, Carbondale, and Glenwood Springs. A gravel section stretches from Cemetery Lane to Woody Creek. Road bikers can use McLain Flats Road as an alternative path around this section of the trail. Description ~ This trail pays tribute to the 14 firefighters who perished on this mountain in the Storm King Fire on July 6, 1994. The trail is deliberately rugged, with steep slopes and unstable footing to give visitors a sense of the conditions firefighters work in. The trail climbs steeply up a slope and onto a ridge for 1 mile to an observation point. From here, a more primitive trail drops into the gully and then makes a steep climb to two locations where firefighters died. A memorial to the 14 firefighters is also located at Two Rivers Park in Glenwood Springs. Description ~ The Wulfsohn Trail is an easy trail you can hike, run, and mountain bike that is dog friendly. 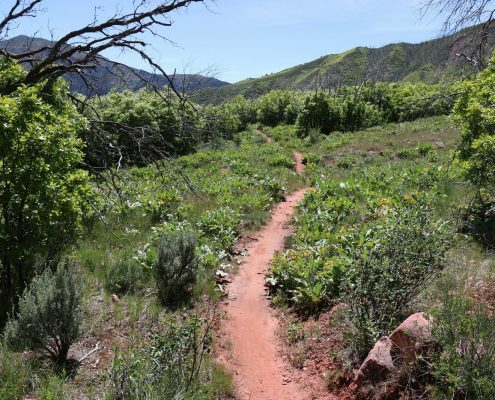 This is a 1.5 mile dirt trail on Wulfsohn Mountain Park in Glenwood Springs located behind the Community Center and Glenwood Meadows Shopping Center. 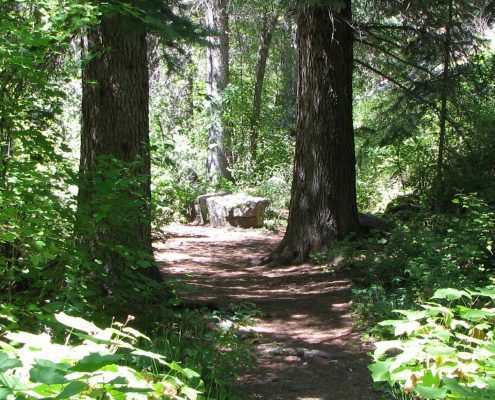 The trail is part of a 7 mile-wide trail system consisting of diverse terrain for hikers, runners, and mountain bikers. A portion of the system is comprised of an easy cinder path that loops throughout the park.